There are reasons to start plants from seed. So you can plant when you want - this is if you have the means to make a plant survive outside of its normal growing season. Economy- Example - You are making a very small garden and it is either easier or cheaper to buy the few plants that you need. Finally, I must say that not all plants are started from seed and then transplanted to your garden. Some plants (many of them) are seeded directly in the garden. The containers can be anything that is deep enough to allow root development. My favorite free container is the half-gallon and quart-sized cardboard cartons, but it's only a favorite as long as I need to buy the product that is inside the container. The rectangular shape of the carton is convenient to me because it has corners, it a rectangle, and the width is not so wide that it'd easily fall off of a window sill. Rectangular shaped containers are better than rounded shapes because several of them can be placed up against each other to share light and warmth. Using a Carton - Cut one side of the container so that it can be turned up. Write the name of the seeds that you planted on the flap. See the image above. Drainage is another feature to provide in your make-shift planter. Store bought seed starter trays come with drainage and, many times, a tray, so do what you can to mimic this feature and provide drainage for your seedlings. If too much water is added to the soil and there's no way for the excess to drain, then your plants could die. Provide light to the seedlings. If you cannot provide sunlight, then do the best you can to insure that your seedlings get enough light. If your seedlings get "long-legged" then they are not getting enough light. Your seedlings will need food. 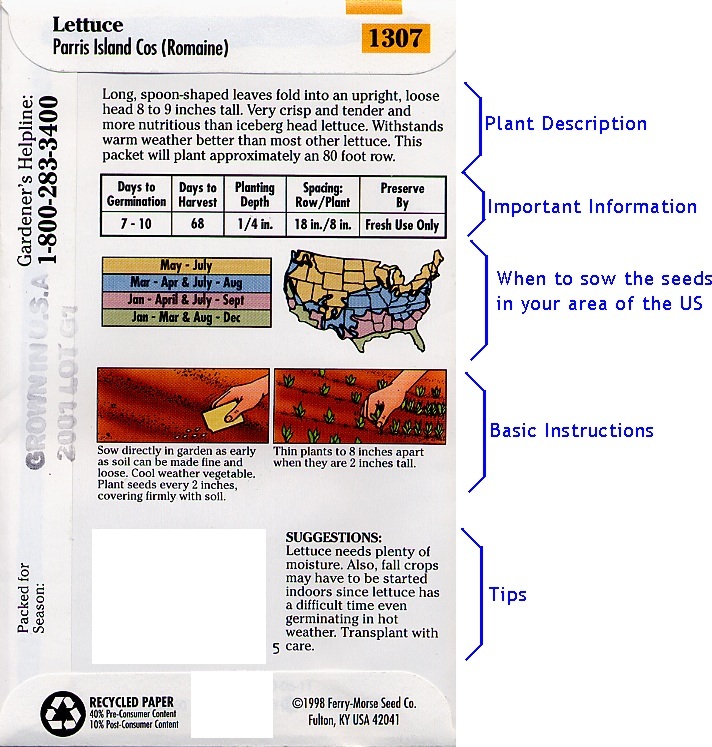 Some potting soil mixes already contain plant food, check before feeding. 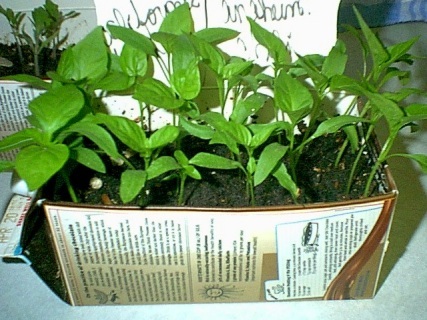 Seedlings will still need warmth though not to the degree that the seeds needed. Do not set your seedlings outside, and exposed to weather, if the temperature will be below 50 degrees F. Some plants are adversely affected by being exposed to cold temperatures when they are seedlings. When the temperature is good for the plants, set them outside in either a garden plot or a pot. Some plants will need the soil to be warm before setting out. Some plants can be set out when it is cool outside. Most plants will need to be "hardened off." To harden off a plant, set it outside in partial sun for a few sunny or mostly sunny days. When in doubt, research the plants that you've chosen to grow and find out what the plants need. 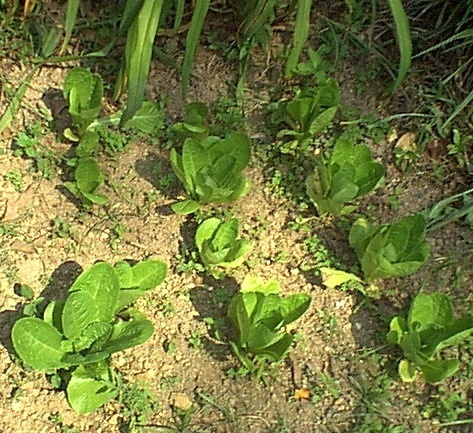 Note- the lettuce plants in the photo below were seeded directly in the garden, not in containers. Copyright 2002 by Donna Young. All Rights Reserved.